The Denver Nuggets were fresh off of another impressive victory over the Minnesota Timberwolves on Saturday. In the 107-106 win against the Timberwolves, it was All-Star center Nikola Jokic who recorded his 25th career triple-double with a stat line of 13 points, 16 rebounds and 10 assists. 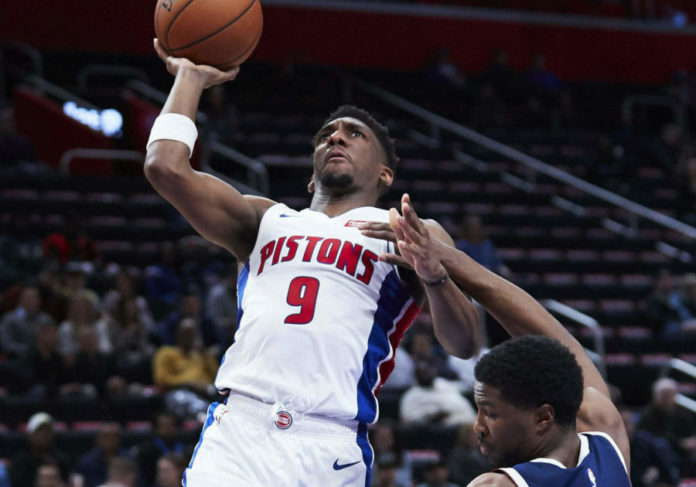 The Nuggets were on a six-game winning streak and moved into first place in the Western Conference with their win, but seen that streak come to an end in Detroit against the Pistons behind Andre Drummond’s 27 points and 12 rebounds. With the 129-103 loss, the Nuggets move to 14-12 on the road and 37-16 on the year. With that ,I give you the good, bad and ugly. Monte Morris is from the city of Flint, which is about 70 miles away from Detroit. So when Morris and the Nuggets rolled into the Motor City, Morris made it a point to have a good game in front of a 100-or-so family and friends. 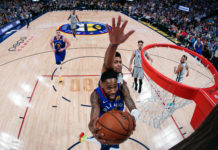 Morris started the game for the injured Jamal Murray and finished the night with 18 points and three assists while not committing a single turnover in 34 minutes. He ran the offense and scored at will in front of the home crowd. Morris’s high school coach had nothing but positive things to say about his former standout when he was interviewed by Katy Winge of Altitude Sports. Morris has been a revelation for the Nuggets and, because of his massive role in Denver, he deserves more attention as a candidate for Most Improved Player. The Nuggets started the game extremely hot as they shot 9-of-11 from the field early on. The only issue was that the Pistons were also shooting the lights out of the gym and they used that shot making to take control of the game from early on. Prior to the game, Malone said that Denver would have to get some defensive intensity into the game early on and the Nuggets did not do that as they allowed the Pistons to shoot 54 percent from the field in the first quarter. The Pistons also came into the game as the worst shooting team from beyond the arc in the entire NBA, but they knocked down six 3-pointers in the first quarter alone. The relaxed play on the defensive end of the floor carried into the second quarter where the Nuggets lost the frame 34-19. Then, in the third quarter, the Nuggets allowed the Pistons to go on a 14-0 run which had them playing catchup for the rest of the game. 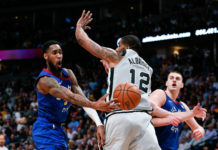 The Pistons player who took advantage of the Nuggets bad defensive night was none other than Andre Drummond, who tore the Nuggets up in the painted area with power post moves and offensive rebounds. Denver went into the game with the understanding that a key to the game would be limiting second chance opportunities and rebounds, but Drummond destroyed that game plan single-handedly. Detroit was active all game and out-rebounded the Nuggets by 21 boards. Drummond in particular had a phenomenal game as he finished with 27 points and 12 rebounds. He came into the game as the best rebounder in the entire league. He used his size, quickness and physicality to open things up which contributed to Detroit’s 26-point win. Against the Pistons, the Nuggets found themselves in a spot that they have grown familiar with; undermanned. Denver was without Gary Harris and Murray for the third-straight game, but it was a surprise when Paul Millsap sat out of the game as well. Murray was out with a left ankle sprain, Harris sat with an adductor strain and Millsap was out due to a sore right ankle. Without having three of their starters it forced Malone into using some unorthodox lineups. To start the second quarter, in an effort to space on the floor and also having to utilize a shortened roster due to injuries, Malone elected to go with the lineup of Morris, Torrey Craig, Juancho Hernangomez, Trey Lyles and Tyler Lydon which ended up being disastrous. 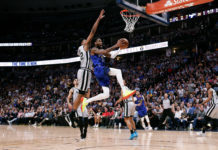 The Nuggets were only able to muster 19 points in the second quarter and that line up in particular was outscored by ten points in just three minutes together. What really stood out as a negative was Lydon’s minutes. Lydon had an underwhelming appearance as he only played eight minutes on the night. He posted a plus/minus of -7 on the night and really struggled on the defensive end of the floor. Lydon’s only shot was a layup attempt in the second quarter that was blocked which sent him to the ground. He did record an assist and two rebounds in his time but his performance was disappointing overall. With so many players unavailable this was the perfect opportunity for Lydon, who does not play often, to prove his worth, but he unfortunately fell short in Detroit, as did many of his teammates.